Back to School: Who is caring for your young children? It’s back to school time! Those words usually invoke thoughts of children who attend kindergarten through 12th grade—but it also applies to many of the 11 million children enrolled in child care or preschool every day. As families drop off their children for these important early learning experiences, many are unaware that only about 30 percent of children nationwide are enrolled in a high quality program. Well qualified staff is at the top of the list of the specific research-based factors that ensure safe, nurturing, and stimulating environments for young children. Still, too many people think that working with young children is a job that almost anyone can do. Teaching numbers and letters, or reading storybooks—what could be easier than that? 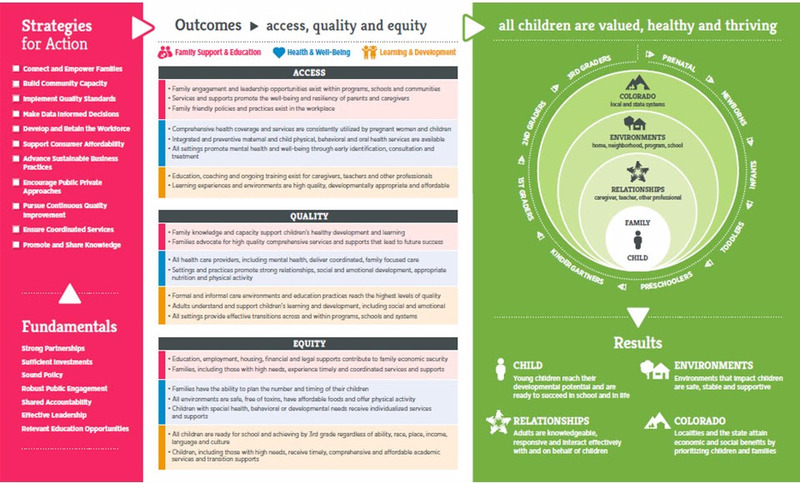 Thanks to the dedication of hundreds of early childhood stakeholders across the state, we have an updated roadmap, the Early Childhood Colorado Framework (Framework), to continue to build on our successes and achieve an integrated and comprehensive early childhood system – across early learning and development, family support, and health and well-being. Early childhood partners across Colorado used the 2008 Framework to support organizational efforts and build alignment across the state, and the updated Framework builds upon this success. Not one individual, organization, or agency can do it all, but together our collective work at the state level, in local communities, and through public-private partnerships will help us ensure all young children in Colorado are valued, healthy and thriving. Join us for a Lunch & Learn webinar to discuss the updated Framework! Early Childhood Leadership Commission Manager, Sheryl Shushan, will provide an overview of the updated Framework to prepare the Partnership for action at the in-person Partnership meeting on October 26. So grab your lunch and join the discussion! The "Stand With Women and Families" has launched. This long-term effort is dedicated to fighting against limits that stand in the way of the health and dignity of Coloradans, but also to pushing for forwarding thinking policies that will truly meet the needs of women and families. This is particularly important to women of color who are disparately impacted by barriers to reproductive and economic justice. 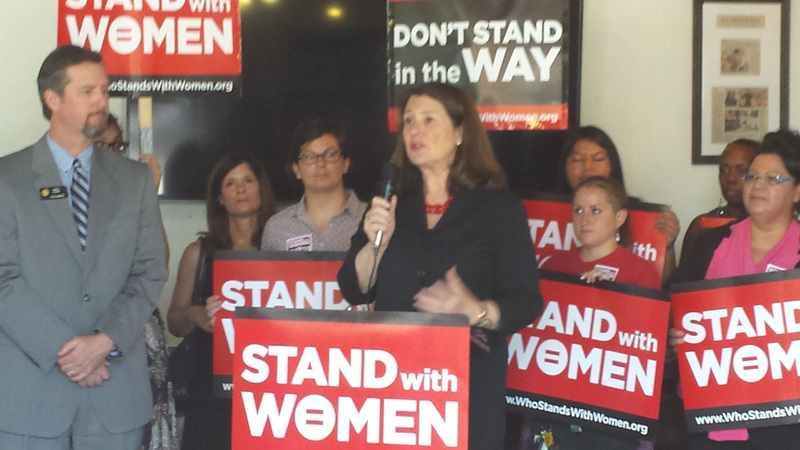 COLOR, 9to5 Colorado and ProgressNow Colorado joined Congresswoman Diana DeGette, Senator Andy Kerr and Council Member Maria De Cambra to launch the state-wide campaign "Stand With Women and Families or Stand in the Way." Maria Empanada, a small business on South Broadway and famed by its score of delicious Argentinian cuisine, served as the host. Lorena Cantarovici, as a small business owner, a Latina, a woman and an immigrant applauds champion elected officials who stand with women and families to support freedom, family values, fairness and opportunity. 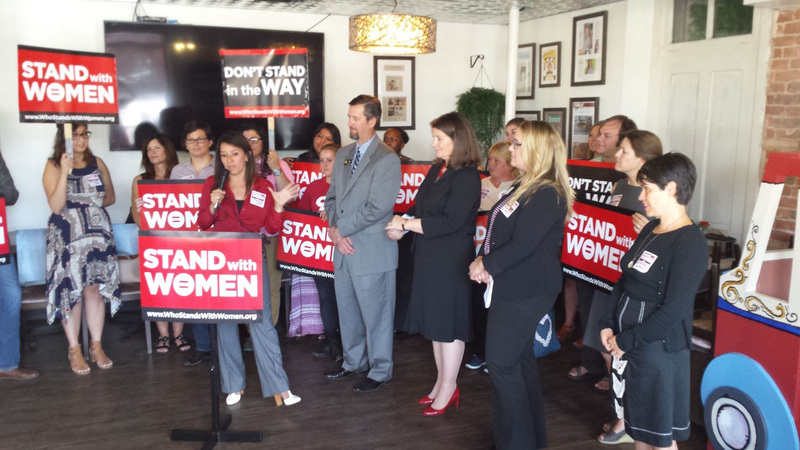 ICYMI: Check out our Storify covering the #StandWithWomen trail on Twitter. Watch the video here from the launch. Read the statementreleased today, and the coverage from The Denver Post. There is no reproductive justice without economic justice, and more equitable, non-discriminatory labor policies, living wages, paid sick leave and forward thinking policies are needed in Colorado. Your voice counts! Show decision makers that Coloradans want to see action to meet the needs of Coloradans. Please, speak out and sign the pledge TODAY! Mandate the use of the Centers for Disease Control and Prevention’s Sudden Unexplained Infant Death Investigation Reporting Form (SUIDIRF) for law enforcement agencies and coroner offices during infant death scene investigations. Mandate that hospitals develop and implement policies to provide education and information about infant safe sleep promotion and to require the practice and modeling of safe sleep behaviors in labor/delivery and neonatal intensive care unit (NICU) hospital settings. Modify Colorado Department of Human Services’ rules regulating family foster care homes to better align with the American Academy of Pediatrics (AAP) infant safe sleep recommendations, including training for foster families regarding infant safe sleep. Establish a statutory requirement that allows for primary enforcement of Colorado’s adult seat belt law, making it possible to stop a driver and issue a citation if anyone (the driver and all passengers in all seating positions) in the vehicle is not properly restrained. Increase funding for the Office of Suicide Prevention to implement the following activities: 1) expand the Gun Shop Project to more counties in Colorado; 2) expand the implementation and evaluation of Emergency Department-Counseling on Access to Lethal Means (ED-CALM) training statewide; and 3) expand implementation and evaluation of school-based suicide prevention programs statewide that promote resilience and positive youth development as protective factors from suicide. Support policies that impact the priorities of the Colorado Essentials for Childhood project: 1) increase family-friendly business practices across Colorado; 2) increase access to child care and after school care; 3) increase access to preschool and full-day kindergarten; and 4) improve social and emotional health of mothers, fathers, caregivers and children. Provide funding for the Colorado Consortium for Prescription Drug Abuse Prevention to promote uptake of the Quad-Regulator Policy for Prescribing and Dispensing Opioids through increased training and education of prescribers. Increase funding to Child Fatality Prevention System to support the implementation and evaluation of youth programs that promote pro-social activities, resilience and positive youth development as protective factors from child fatalities statewide. Feel free to disseminate the Fiscal Year 2015: Colorado Child Fatality Prevention System Annual Legislative Report to your partners. Kaiser Permanente is excited to announce the release of a request for proposals (RFP) to decrease food insecurity. Kaiser Permanente is investing up to $1,000,000 over two (2) years with awards up to $100,000 per organization. Food insecurity refers to the degree to which food intake is reduced or normal eating patterns disrupted because of lack of money and other resources. Organizations may submit proposals that focus on one or both of these outcomes by implementing best practices. Eligible organizations must be a 501c(3) with an annual operating budget of $1.5 million or less or a Colorado health care Safety Net organization with an operating budget of any size. To be considered for funding, organizations must also meet specific eligibility criteria outlined in the RFP. Organizations interested in applying for funding should review our frequently asked questions and read the RFP in its entirety. The funding opportunity is currently released on the open funding opportunities page of our website (kp.org/share/co). We will be conducting two webinars that organizations can register for to learn more about the RFP and ask questions. If there are questions after the webinar, please direct them toco-contributions@kp.org. Applications are due October 30, 2015 and the grant period will be March 1, 2016-March 1, 2018. Recent years have brought great promise for prevention, providing the opportunity for interdisciplinary, comprehensive approaches to keep everyone healthy and safe in the first place. Join Prevention Institute’s Founder & Executive Director Larry Cohen and Program Director Sheila Savannah for a discussion on emerging prevention transformations, with a focus on public health’s role in advancing health equity, community resilience, and health system transformation. This is a time of great opportunity to move our focus from sick-care to health; from attention to the individual to community-level solutions; from trauma to resilience; and from public health as practitioner to public health as facilitator and catalyst of change.Prevention Institute (based in Oakland, California) is a national nonprofit that helps shape the way that we think about health: improving community conditions, reducing inequities, and taking action to prevent illness, injury and violence before they occur. Larry and Sheila work with communities, policymakers, and philanthropy to advance a deeper understanding of how community factors influence health, safety and equity.